With increasing needs for encryption and security, delivering content over HTTPS is becoming more critical for your business. To help you deliver content safely, we’re now offering support for the Domain Validated Subject Alternative Names (DVSAN) HTTPS certificates in the IBM Cloud Content Delivery Network (CDN). With this new important feature, IBM Cloud users can now securely deliver content using their own domain names rather than using wildcard certificates. Associated with IBM Cloud Object Storage, IBM Content Delivery Network powered by Akamai, will help your business thrive on the IBM Cloud by storing and delivering your content efficiently through the cloud. IBM’s commitment to excellence and continuous improvement allows you to take advantages of the latest innovations. IBM Cloud Content Delivery Network Offering also fulfills the requirements of the EU General Data Privacy Regulation (GDPR). Interested in learning how you can get started with IBM Content Delivery Network? We have all the steps listed out for you below. The latest CDN version is available in our IBM Cloud portal. Once you have created your account, you’ll be able to distribute your content over the Akamai network in just a few hours. The configuration of your CDN mapping takes less than 30 minutes. While configuring your CDN mapping order, you can choose to allow web traffic through HTTPS and HTTP, as before. When you choose HTTPS, you now have the option to choose which type of certificate to use. The new DV SAN certificate is currently the default option. CNAME – IBM, Akamai and the CA will automatically complete this DCV through the CNAME record that you would have created. Standard – Your origin server will need to serve the correct challenge response file when the CA makes requests through your CDN mapping’s domain. Redirect – The CA will also make the same requests, but would have been instead redirected by your configured origin server to Akamai for Akamai’s copy of the challenge response file. The details on these three methods become available as soon as your CDN mapping reaches the “Domain validation needed” state. When you click the button on the notification bar concerning DCV, you will be able to see the information and instructions for addressing the DCV challenge under various tabs. After choosing your method and setting up your DCV challenge response, the rest of the process is automatic. Your CDN mapping will continue to progress through the following statuses until it either reaches “CNAME configuration” or “Running” state. 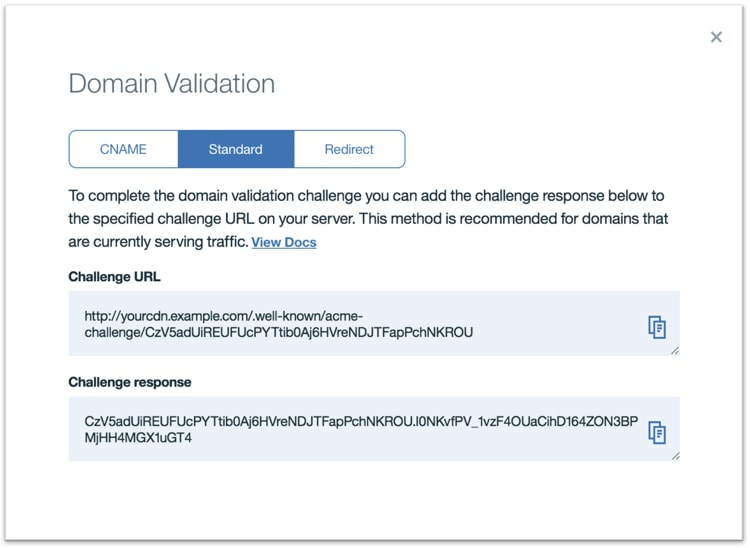 If you had chosen the CNAME method to address the DCV challenge from the CA, then you’re done! The CNAME DNS record that you would have created will also satisfy the steps required to transition your CDN mapping from “CNAME configuration” to “Running”. If you had chosen either the Standard or Redirect method, then your CDN mapping will reach “CNAME configuration” state. For either of these two methods, you would have created an A record to your origin server for fulfilling the DCV challenge. Now, you will need to go to your DNS provider to remove the previously added A record and to create the aforementioned CNAME record. Afterward, your CDN mapping will shortly move to “Running” state. As soon as your DV SAN CDN mapping has reached the “Running” state, you will be able to safely access your content that is secured by HTTPS through your fully personalized domain. Feel free to get started today, or chat with a network expert for more details.